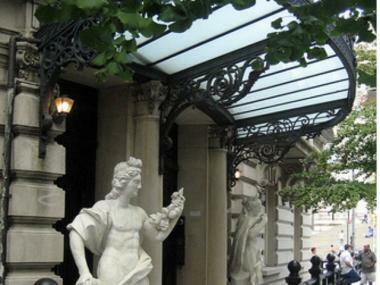 French classical sculpture stands at the entrance to the Duke-Semans mansion on East 82nd Street, which can be yours for $50 million. UPPER EAST SIDE — A landmark Fifth Avenue palace once home to Doris Duke's family, then snapped up four years ago by a cabdriver turned oil tycoon, is back on the market for a whopping $50 million, the New York Post reported. 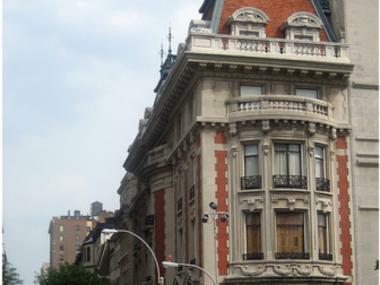 The Duke-Semans mansion at Fifth Avenue and 82nd Street — directly across the street from the Metropolitan Museum of Art — was supposed to serve as a glorified art gallery for Georgian-born billionaire Tamir Sapir. Sapir, 62, bought it for $40 million in 2006, $10 million less than the original asking price. He said at the time he wanted to use the building to display his rare collection of ivory carvings — but his company was later busted for bringing them and other items from endangered species into the country illegally on his yacht, the Post reported. The landmarked Duke-Semans mansion on Fifth Avenue at East 82nd Street is back on the block for $50 million. The Beaux Arts-style mansion, built by the tobacco titans Duke family in 1901, is one of the only private homes on the Avenue. It reportedly attracted interest from rocker Lenny Kravitz before Sapir bought it, according to the New York Times. No word on who might be looking at it now. The 19,500-square-foot manse boasts 11 marble fireplaces, 12 bedrooms, 14 bathrooms and three elevators, according to published reports.